“How much money you got?” Michael wiped his gluey nose on a sleeve. “Can’t. Oh, never mind. Let’s go.” He grabbed her hand. The ground rumbled. They wriggled beneath a loose sidewall and gawked transfixed as the white horses were galloping into the ring. “Hey, you!” Rough hands grabbed their britches. Categories: age, backward, children, lifestyle | Tags: journey, magic, money | Permalink. Oh no, caught sneaking into the circus. Whatever happened to those pesky korders? Can’t help thinking hole in the pocket. I can just see those two–where were their parents?? A fair is a fair is a fair? Maybe they couldn’t afford to go and the kids stole the money…oh bad kids. Bad kids but they tried so hard to get to the Big Top…. That really came alive for me. I was often called Suze as a kid. I hope they got away! Isn’t that what they are for? I had only sister and I was the oldest. Yeah. I played the out-of-jail card. I can smell the sun on dirt, the sweat on the kids’ faces – very good, Tess! Fast ball – you set it the scene and delivered. SCORE! I stink at sports but if you see a score here, it’s a goal, yeah, I think that’s what I mean. Not up on sports terms but I know what you mean. 😀 Ha ha. You had me at ‘gluey nose’. 🙂 I wanted to run with them! The horses AND the kids. It’s precious, isn’t it? Green, white, whatever color. I give you credit. Writing short pieces is more challenging than long. I love the little girl’s speech patterns. Excellent response to the prompt, Tess. You do know kids, from gluey noses to run forit! Ah bless them, it reminds me of scrambling under the fence to get into the Devon County Show for free when I was a kid! Kids are a wonder, aren’t they? I need to practice more stealth. You had me a “gluey nose.” Fantastic story! Good story, Tess. Is there still circuses? Maybe there is in Las Vegas but I doubt any place else. Or am I wrong? Korders were hard to come by. A fitty cents even harder. A dollwar – oh – fat city. You are sweet, Willow. Sweet and thank you. Happy weekend to you too, Geraldine. Ah yes, back in the day…the things you could do with a quarter. Penny candy, a bus ride across town for 10 cents. Lunch milk for .05. I could see the kids in my mind as the horses entered the ring. Standing transfixed against the wall! Entertaining for sure! Thanks, Tressa. Thanks for stopping by. NICE to see you. You too my friend! I haven’t had internet connection for a few weeks so had to get caught up on all my reading. Your the first on my list! 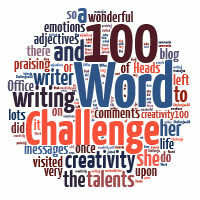 Do you like the 100 word challenge better than the other? Now I have goosebumps. +*_*+ That’s quite a compliment. Thank you. What / how do you use for internet? Just realized I hadn’t answered your question. Far from it! Your ‘word talent’ and many other talents tickle me time and time again. I'm simply being me. Silly when I can to enjoy a few laughs every day. Naughty children with ‘gluey’ noses, sticky, pudgy fingers and pronunciation issues are my favorite kind! They are the ones with the best adventures!